Over time, teeth will begin to deteriorate naturally from regular wear and tear. When a tooth has become too deteriorated, it might need to be extracted. If multiple teeth are extracted the dentist may recommend dentures as the most appropriate solution. Dentures can create a natural and healthy looking smile. At the same time, dentures will not only enhance your smile but will improve your looks and self-esteem. A full denture is used when few natural teeth remain. In order to fit the dentures, the dentist will remove any teeth remaining. The dentist will then make a mold of the gums, and the mold is then sent to a dental lab where the custom dentures are made. Partial dentures are made the same way but are only used when only a few teeth are missing. In order to prevent the embarrassment of being without teeth, immediate dentures are used. The patients receive their dentures the same day their teeth are removed. Once the extraction sites start to heal and the bone remodels, your dentures will need adjustments in order to make it fit better. Once your healing has been completed, the dentist may recommend a new denture. The dentist might recommend over-dentures if the roots of a patient’s teeth are strong enough. This is because over-dentures will fit on top of the natural teeth in the mouth. When over-dentures are used, the remaining teeth are re-sculpted and covered with metal caps in order to prevent future decay. 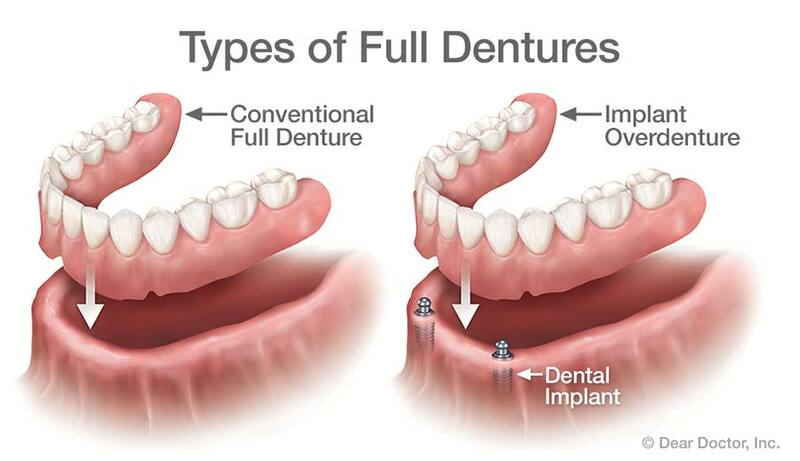 One of the benefits of over-dentures is that they do not have to be adjusted as frequently as regular dentures. Over-dentures cause less recession of the jaw and gums, and they also cause fewer bite problems than complete dentures. Since your gums and tissue are not used to being in contact with the material the dentures are made of, there will be some discomfort. After you receive your dentures, they should be worn continuously for the first few days to reduce the possibility of swelling that might occur in the gums and other tissues. The swelling usually goes away in about two to three days. Until the patient gets used to their new dentures, these may feel loose and awkward while chewing food. As such soft food is recommended for the first few days. In order to overcome any speech impediments that may occur from the new dentures, reading aloud will help. It usually takes patients longer to get used to lower dentures than upper dentures. The jawbone will also take several months to completely heal, and get used to the dentures. After the patient is used to their dentures, the dentist will create a permanent lining for your teeth. This lining is a soft material that cushions the contact between the dentures and the gums. Generally, dentures will last about five years, but with proper care and daily cleaning with normal or specially-made denture toothpaste should make dentures last longer. After the swelling has gone down, it is better to leave one or both dentures out in water overnight. This allows the gum tissue to breathe and prevents the dentures from warping. Due to wear and tear, the lining of the dentures will change. Eventually, dentures may come loose because of bone shrinkage, the teeth may become worn down, or they will break. In this case, the dentures will need to be remade.